Hanukkah is an amazing celebration. Another name for it is the festival of lights. It is about miracles. In the history of Hanukkah, two miracles happened. One of them is when the Jews were going to light the menorah, they only had enough oil to last for one night. But a miracle happened and it lasted for eight nights. 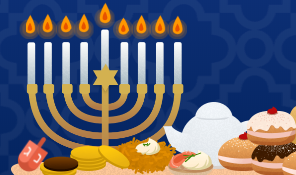 This is why Hanukkah is celebrated for eight nights. Also the Jewish army (the Mccabes) defeated the Greeks. It is a tradition to play dreidel. My family does, but not on every night. To learn how to play, check out this video: How To Play Dreidel. You should definitely try it out. My family mostly celebrates Hanukkah the traditional way. First we have dinner. If my dad is home, we eat dinner as a family at the kitchen table. We almost never eat here. So, Hanukkah is pretty special to us. For dinner we have something with latkes. 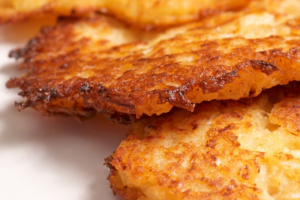 The latkes we eat are from Trader Joes. They are so delicious! At sundown, it is time to light the candles. My family usually is doing something else, so we light it about an hour or two late. We recite two prayers, three on the first night. We also sing a common song that’s in Hebrew called Maoz Tzur. There is a transliteration in English, but we don’t sing it because Maoz Tzur is supposed to be in Hebrew and because we don’t really know it in English. Hanukkah of 2017 was my first year to be lighting my menorah. My sister sometimes helps my dad light her menorah. We usually have two or three menorahs. This year I lit one that I made at Hebrew school. Menorahs have eight candles, one for each night. 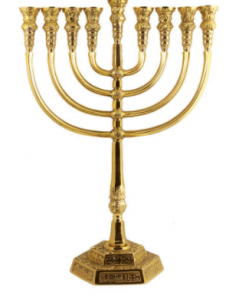 There is also a shamash (the helper candle). 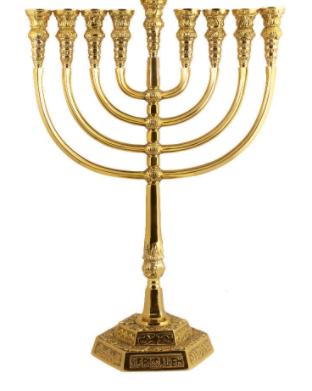 It is lit to light the other eight candles and is higher than the rest if the candles on the menorah. Now it is time for my favorite part! Opening presents. They are displayed on the dining room table. My sister and I pick one out of the pile. We rip it open, eager to see what’s inside. Then our parents have found a smile on our faces. 🙂 “Happy Hanukkah!” we all say. Wow! Nice post, Arielle! I love how you explained the important parts of Hanukkah and included links. I think this makes the post so much better. Ari you did such an amazing post! I LOVE everything. I like how you included links about how to do things. I love how all of your links had to do with the topic. Impressive! This is well written and describes the holiday and our family traditions well. Why am I first reading this now?